It's been a busy couple of weeks, but I finally had time to stamp! 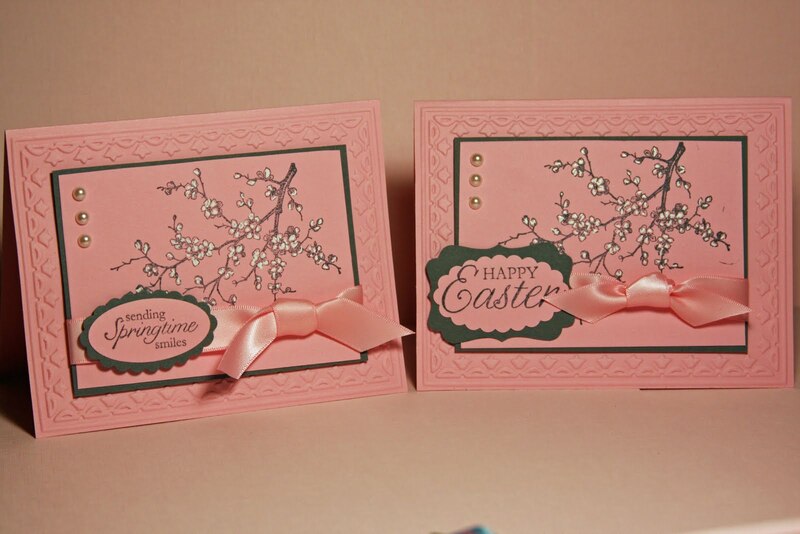 I made these cards using the Easter Blossom set from the Occasions Mini Catalog. 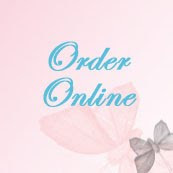 You can order from the Occasions mini through April 30, 2011. I like to make a couple versions of each card when I create. 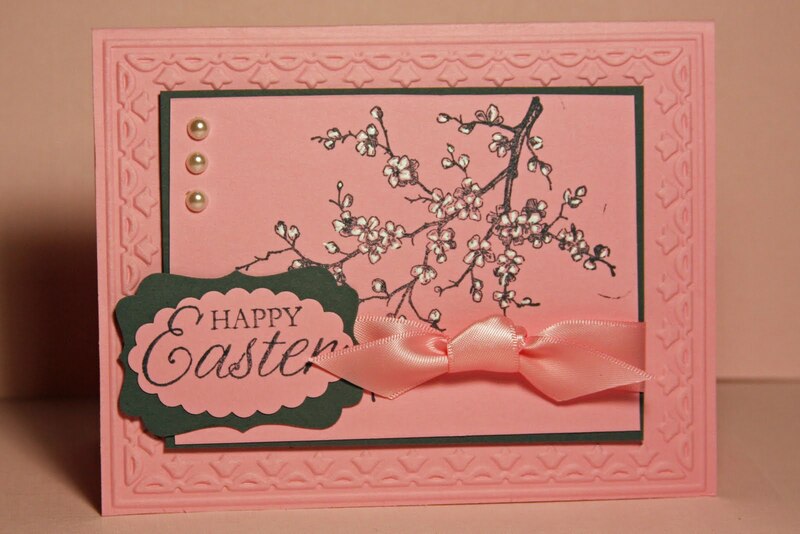 Using different sentiments, I always have cards on hand when I need them. I like how they turned out... and these were simple to make. 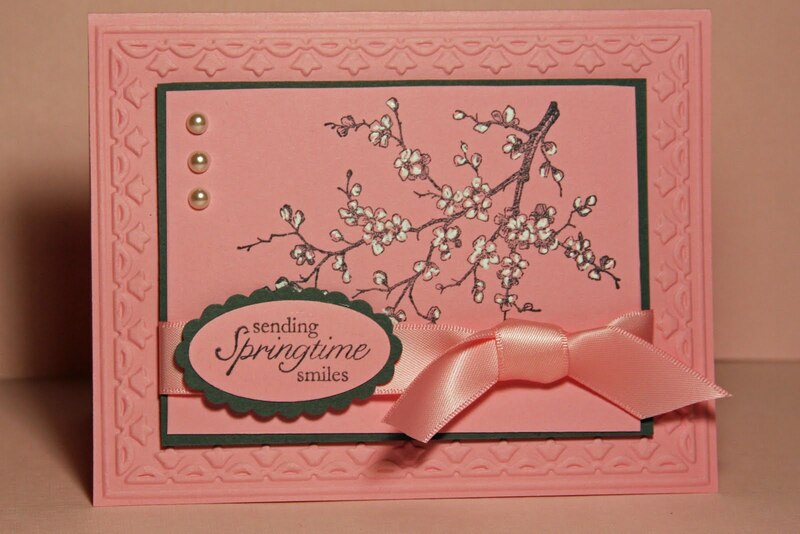 Here is a closer look at the card using Oval punches and scallop oval punches and the Sending Springtime wishes from the Easter Blossoms Stamp Set. I stamped the branch and sentiment in Basic Gray. Then I took a white gel pen and colored the flowers lightly and carefully to allow the stamped image to show through the white gel pen. 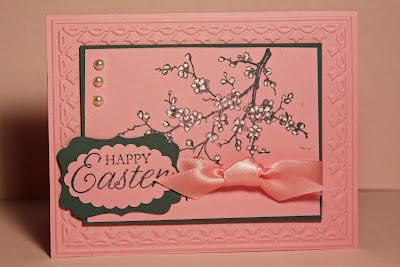 I used the Framed Tulip Textured Impressions Embossing Folder on the basecard to create the raised boarder. Pretty in Pink satin ribbon added a touch of elegance. Thinking of placing an order? 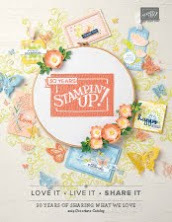 Check out the restocked Stampin' Up! Clearance Rack items including great grab bags, while they last. 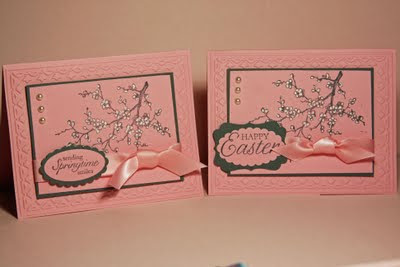 Also, check out the Spring is Blossoming promotion giving you a sneak peek at two brand new prducts from the upcoming 2011-2012 idea Book & Catalog. 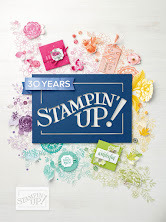 From April 1-30, Four Frames Stamp Set and Paisley Petals Designer Series Paper can be ordered with a $20 minimum purchase or get them FREE when you host a $350 workshop. These products wont be available again until July 1. ﻿I'm so excited! 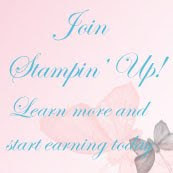 I just signed up for Stampin' Up! convention in July in Salt Lake City. 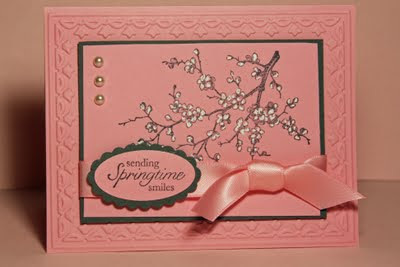 Early registration for demonstrators ends April 12 and saves your $30. If you've been thinking of starting your own business and want to attend Convention in July, it's not too late to join stamping up as a demonstrato and register for Convention while seats are available.